Looking For Remarkable Customer Reviews? A critical factor influencing customer service is how you or your cleaning technicians impress and bond with customers. This is where good people-skills come into play. Customer prefer to be treated in a friendly, and accommodating manner that meets their needs. New customers may “read you” to determine if they think you are arrogant, self-centered, bossy, aloof, or disrespectful. In other words, if you are a giver or a taker. Believe me; you will only excel in business when you learn to display congenial and mature attributes. Several years ago, I sold off the contract I had to clean three department stores. It included cleaning six-days a week plus extensive carpet and floor care services that often required working all night. One of the challenging parts of the job was the strip and recoat operation of the terrazzo floors. I thoroughly trained Bob, the new owner who purchased the accounts from me. However, his floor care and management skills in running crews were noticeably deficient. In spite of turning out substandard work, Bob would call the store manager to schmooze. In other words, he was so charming he could immediately diffuse the manager’s disappointments. Then, he would promise that next time his crew would be better trained and deliver superior results. Bob’s PR efforts and charisma easily won over the managers, coupled by improving his performance and quality. Conversely, I have observed cleaning company owners who lacked the required people skills and lost accounts due to these shortcomings. When you onboard new workers, review the list of your expectations regarding performance and personal conduct. Then, teach them how to build good relationships with your customers by employing an affable approach. Often you need to understand your customers better than they understand themselves. They may not tell you where their pain is located or articulate their unmet needs, so you should determine this as best as possible, and endeavor to respond to those needs. Conveying a welcoming and pleasant phone manner when you answer the phone. Scheduling the job when it is desired, to prove you are accommodating. Pricing the work so it appears to be reasonable. Arriving on time with a nice looking vehicle. Greeting the customer with a polite and warm presence. Inspecting the carpet, discussing any challenges and confirming the pricing. Promptly setting up of the job. 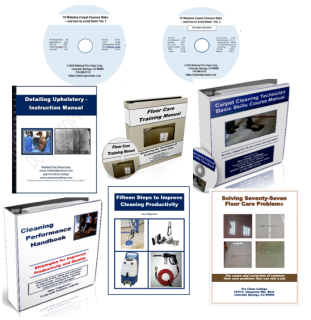 Demonstrating that you perform with a professional cleaning process. Protecting contents and furniture from any harm. Amazing the customer with the cleaning results. Discussing any areas that are not responding to normal cleaning procedures. Avoiding excuses such as, “We can’t do that because it is against our policy”, “If I do this special favor for you, then I would need to do it for everybody”, and “I don’t have the authority to decide that, you will have to call our office”. Wrapping up the job including accurate invoices presented with an attitude of gratitude. Delivering carpet that rapidly dries. Avoiding wick back or call backs. (Sometimes this will be unavoidable, but strive to prevent it from happening regularly. Determine if you can add to this list and customize specifics to match your operations. Excelling in customer service requires that technicians are thoroughly trained in mastering your Impression Points. This becomes the right track to gain remarkable reviews. Gary Clipperton is a 45-year industry veteran and author of several books, training programs, software and videos. His new training program includes a carpet startup and expansion program, IICRC Basic Skills Carpet Care program, and Cleaning Managers Dashboard all in the new Carpet and Floor Care Bundle available through Totally Booked University. Gary can be reached at gary@nationalproclean.com or 719-598-5112.